Groupe Country Rock US formé en 1971 par Wayne Moss, Mac Gayden, Kenney Buttrey & John Harris. Et les nouveaux membres : Russ Hicks, Kenny Malone, Bobby Thompson, Dave Doran, Si Edwards, Buddy Skipper, Terry Bearmore, Jim Colvard, Warren Hartman, Russ Hicks, John Moss, Barry Chance et Mike McBride. Guitarist Wayne Moss remained the one constant member of Barefoot Jerry on the band's recordings for Capitol, Warner Bros., and Monument during the '70s. Moss had played in several rock and R&B groups before he joined Brenda Lee's backing band in the early '60s. Session work in Nashville brought him a credit on Bob Dylan's Blonde on Blonde in 1966, and he also played with the Escorts during the late '60s before forming Area Code 615 with several other Dylan alumni. The group recorded a self-titled album in 1970 and A Trip in the Country the following year, but musical commitments prevented them from touring. Area Code 615 played its only live show in 1970 at the Fillmore West, and broke up soon after. Moss was back in action by 1971, though, forming Barefoot Jerry with two members of Area Code 615 — Vocalsist/guitarist Mac Gayden and drummer Kenny Buttrey — plus keyboard player John Harris. 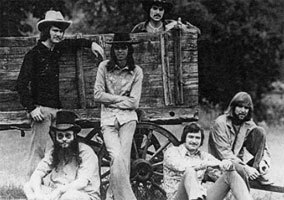 The group signed to Capitol and released Southern Delight in 1971. By the time of the following year's self-titled LP for Warner Bros., Russ Hicks and Kenny Malone had replaced Gayden and Buttrey. Another label change (to Monument) and additional lineup replacements (Si Edwards on drums, Dave Doran on bass, Fred Newell on Vocalss) characterized 1974's Watchin' TV, which featured Moss' friend Charlie McCoy. Barefoot Jerry returned the favor on McCoy's country hits "Boogie Woogie" and "Summit Ridge Drive." 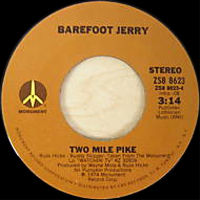 The following year, after Barefoot Jerry recorded You Can't Get Off With Your Shoes On, Monument re-released both the Capitol and Warner Bros. albums on a double-LP set titled Grocery. Moss assembled yet another group for Barefoot Jerry's 1976 update, Keys to the Country. His band included bassist Terry Bearmore, guitarist Jim Colvard, Warren Hartman on various keyboards, and Charlie McCoy, who again made a guest appearance. The same members (sans McCoy) returned for a final album in 1977, Barefootin'. Wayne Moss has continued to play and produce, especially for his friend McCoy.